Why assemble your own ethernet cables? Many online stores sell them for only a couple of dollars each. But certain situations call for using your own custom-wired cables. Maybe you need enough of them to make DIY cables cost-effective; maybe you have unique length requirements; maybe you need to replace broken plugs, or maybe you just want to use up excess cable that you have on hand and would otherwise waste. I'll identify the parts and tools that you'll need, and then I'll explain how to assemble each cable. With the right equipment, you can crank out customized cables in seconds. Let's start with the cables. 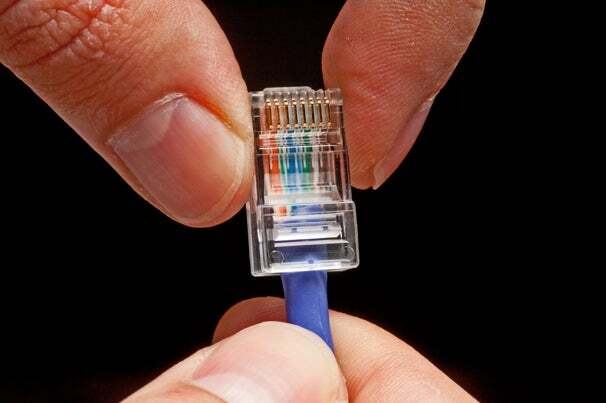 For gigabit network cabling, select Category 5e (Cat 5e) or better. Cat 6 cables support up to 10-gigabit networks and are fully backward-compatible, but most home users don't have any 10-gigabit to support. You'll also need to choose between shielded twisted-pair (STP) and unshielded twisted-pair (UTP) cabling. Either type should work just fine, though STP might be better if you're running cables over long distances and with lots of potential for electrical interference. Finally, decide between solid-core and stranded wires. I opted for solid-core, since I had a lot of that type left over from my home ethernet wiring project. You'll be attaching ethernet plugs to each end of each cable, along with boots slightly behind them to protect the plastic tabs. Buy plugs that match your cable choice--solid-core or stranded--and enough boots to complement each plug. I bought an assortment of colors so that I could keep track of my network wiring more easily. 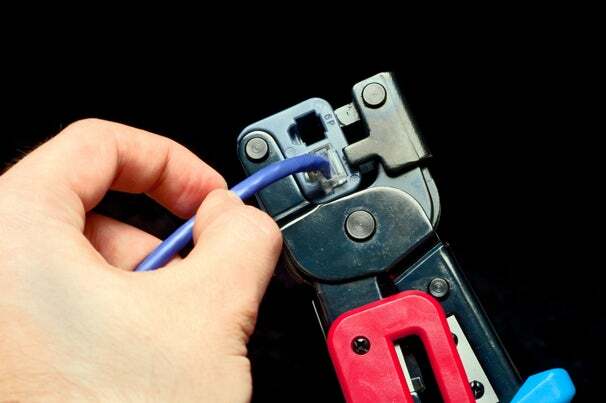 You'll need a wire cutter, wire stripper, or pair of scissors, and an RJ45 crimper. You may be able to borrow these tools from a friend or IT department at your work, or you can buy them online. I purchased everything I needed from Monoprice.com. To verify that the wiring is correct, you'll also want a tester; they retail for $25 or more. Alternatively, you can make your own, as I did. I wired an ethernet keystone jack to a 9-volt battery, a 470-ohm resistor (in series), and four red LEDs (in parallel) so that each pair of wires is associated with its own LED, looping through those parts. I then wired a separate jack in a loopback configuration, so that pairs of wire complete the circuit on the opposite end, bridging 1 and 2, 3 and 4, 5 and 6, and 7 and 8. If the cable that I plug between the two jacks is good, the cable will bridge each circuit, lighting one LED for each completed (and properly functioning) pair. Slide a boot onto the end of the cable, leaving the large boot opening toward the bare end of the cable. Strip about 1 inch of the cable jacket away. Notch down at the end of the jacket, and tear another inch away, using your fingernails or the string inside the cable if available. Trim this jacket off. 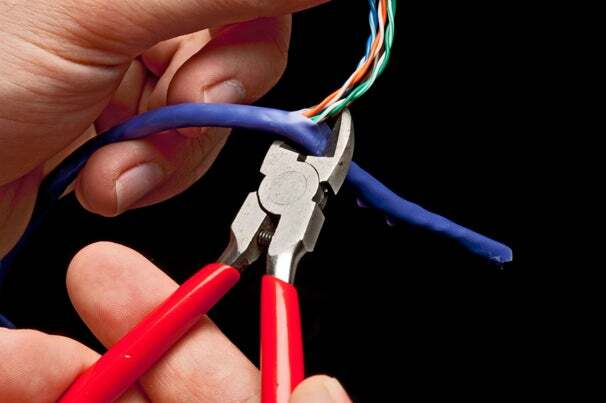 This process ensures that you'll have an exposed and unnicked section of cable to work with; when making the first pass at stripping off the jacket, you may have scored or slightly cut the wires inside. 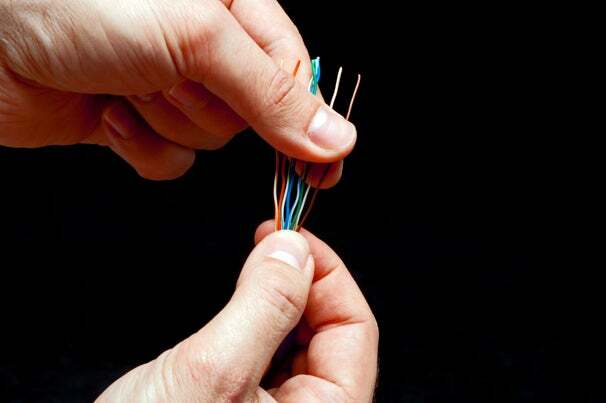 Untwist and straighten the pairs of wires. I like to hold the bundle in one hand and then tug my thumb and finger across the rest. Another approach is to hold both ends of the exposed wire and gently draw it across a curved table-edge. In any event, treat it well, because needless wrangling could damage the wire. Put the eight wires in order as you go. The particular order you use doesn't actually matter as long as you stick to it at each end. Still, I follow the T568B standard, which calls for (left to right) white/orange, orange, white/green, blue, white/blue, green, white/brown, brown. Trim the wires back again, leaving about ¾ inch exposed. Position the ethernet plug with the flat side up and with the opening for the wires facing you. Slide the wires as far into the ethernet plug as possible. You might need to push with moderate force. You'll see them reach the far end, following their assigned tracks. Put the plug into your crimping tool, and crimp it all into place. The copper pieces will slice down, into the wires, and the crimp will push the plug together in two places. If you were successful, you'll see that part of the cable jacket is present within the first crimp. If not, you may have exposed too much of the ethernet wires. Or the exposed wires may have been too short to reach the far end of the plug. Repeat the process as needed. Then plug everything together to build the ultimate home network.